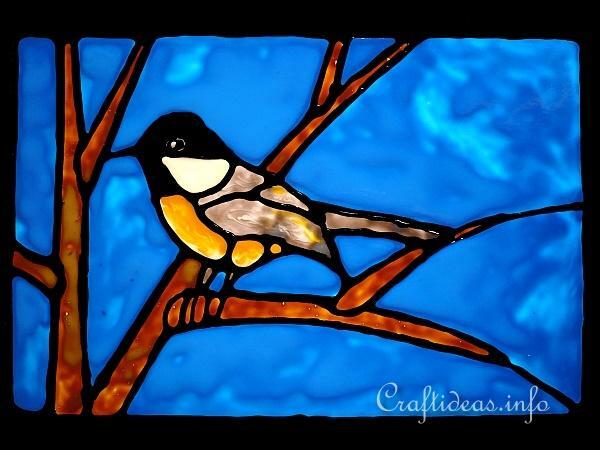 This little bird is so cute and such a fun project for the summer. Window clings are give any window a brilliant glow whether the sun is shining or not. This project is not only great for adults but is easy and fun for kids as well. Permission to use this pattern was granted and is courtesy of Delphiglass.com - your source for stained glass, fusing, jewelry and much more. 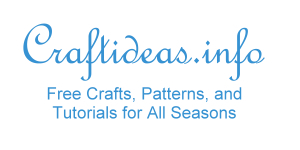 Here you will find kits, tools, supplies, free patterns and project tips. 1. 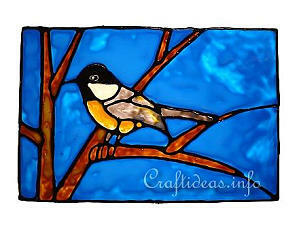 Print out the chickadee pattern and lay the acetate foil over it. 2. Trace the design onto the foil using the outliner paint. 3. Once the paint is dry, you can paint inside the lines with colors of choice. 4. Once the colors dry (depending on the room temperature, it can take up to 24 hours), cut the outside border out and adhere it with the painted side to the window. Tip: Use the hard plastic sheet to ensure durability. You may also choose to use the special glass paint foils that you can peel your design off of.